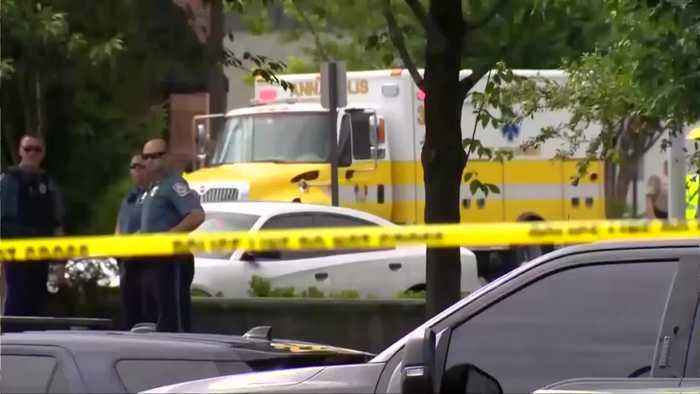 The suspect in a deadly shooting at a Maryland newspaper is being held without bail Friday after appearing at a court hearing via video link from a detention center. Thirty-eight year old Jarrod Ramos is charged with five counts of murder after allegedly spraying the newsroom of The Capital Gazette in Annapolis with gunfire Thursday. (SOUND BITE, Sarah Handel, Annapolis, Maryland) 'These journalists were part of our community. They brought the stories of the people who live here. He is not cooperating with police - who have recovered Ramos's car and searched his home. Ramos had a longstanding grudge against the newspaper and unsuccessfully sued it for defamation in 2012 over an article that reported how he harassed a former high school classmate. He legally purchased the 12-gauge pump action shotgun used in the attack about one year ago. Police said that rumors on social media that Ramos had mutilated his fingerprints so as not to be identified were untrue. Ramos will face either a preliminary court hearing or grand jury indictment within the next 30 days.